Find your e-pill Medication Reminder instruction manual / user manual / user guide below and print it from your browser. Download your e-pill Medication Reminder manual in PDF format by clicking below. Click here to ORDER an e-pill device. Manual: MD1 e-pill Automatic Pill Dispenser XL (MedTime XL / Med-Time XL) Operating Instructions. SKU 991019 NEW VERSION sold from May 15, 2006 with unlimited number of medication times per day (up to 28 Medication Times per Day maximum), Increased Pill Capacity, Early Dose, Longer Alarm duration, Auto Calendar (Day Light Saving Time) and Dispensing History Log File. Manual: e-pill MedSmart VOICE Automatic Pill Dispenser (e-pill MedSmart VOICE ) Operating Instructions. 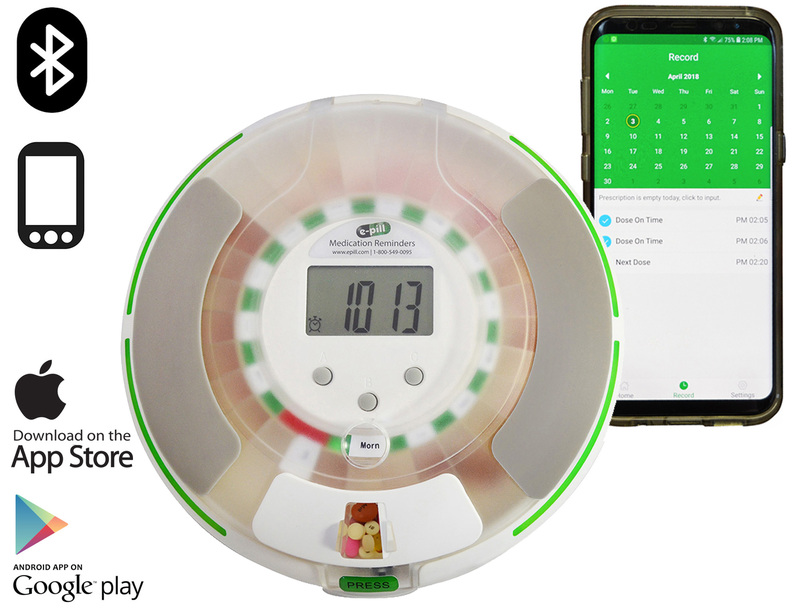 SKU 995019 Integrated with Smartphone App that can be used for setup, alarms with the dispenser, It's time to take your medications! Patient is alerted with a Loud and Friendly Voice Alarm, Simple to Use for the Patient, Long Alarm Duration (Up to 60 Minutes), Easy to Hold with Rubber Grips. Manual: MD1 PLUS e-pill Automatic Pill Dispenser PLUS (MedTime PLUS) Operating Instructions. SKU 992030 (up to 24 Medication Times per Day maximum), Start Date, Stop Date, Increased Pill Capacity, Early Dose, Longer Alarm, Auto-Lock Dispensing Door, Auto Calendar (Day Light Saving Time) and Dispensing History. Manual: e-pill MedTime STATION Automatic Pill Dispenser (STATION) Operating Instructions. SKU 996024 Version A / Dispense up to 4 Medication Times per Day and Increased Pill Capacity. Tipper Device and Reuseable Medicine Cup included (US Patent 9,198,834). Manual: e-pill MedTime STATION Automatic Pill Dispenser (STATION) Operating Instructions. SKU 996024 NEW VERSION (from October 2015) Version B / Dispense up to 6 Medication Times per Day and Increased Pill Capacity. Tipper Device and Reuseable Medicine Cup included (US Patent 9,198,834). Manual: MD2 e-pill MedSmart Automatic Medication Dispenser (MedSmart) Operating Instructions (up to 6 Medication Times per Day maximum, Early Dose, Patient Compliance Dashboard, Unlimited Alarm Duration). Model 660. Manual: MD2 PLUS e-pill MedSmart PLUS Monitored Automatic Medication Dispenser (MedSmart PLUS) Operating Instructions (up to 6 Medication Times per Day maximum, Monitored by Phone, Text Message or e-Mail, Early Dose, Patient Compliance Dashboard, Unlimited Alarm Duration and Dispensing History). Model 660. Manual: e-pill Monitored Automatic Pill Dispenser (MD-2 / MD.2 / MD2 / PMD) Operating Instructions. Click here: Purchase MD.2 / Philips Medication Dispenser Supplies | Download User Guide (PDF format) for Philips Medication Dispenser. Manual PD3: e-pill Tamper Resistant MedTime SAFE Automatic Pill Dispenser (SAFE with 4 Daily Alarms SKU 998024 UPC 837066002453) Operating Instructions. SAFE VIDEO. Click here: Purchase MedTime SAFE Tamper-Resistant Pill Dispenser. Manual PD3: e-pill Tamper Resistant MedTime SAFE Automatic Pill Dispenser (SAFE with Lid Lock and 6 Daily Alarms / SKU 998034 / UPC 837066000527) Operating Instructions. SAFE VIDEO. Click here: Purchase MedTime SAFE Tamper-Resistant Pill Dispenser. Manual: MD3 e-pill Tamper Resistant Automatic Pill Dispenser (CompuMed) Operating Instructions. CompuMed Set-Up VIDEO. Click here: Purchase CompuMed Tamper-Resistant Pill Dispenser. Manual: e-pill CADEX VibraPlus 8 Alarm Vibrating Alarm Watch Black with Silver Buttons (sold 2016 - current) Operating Instructions. Manual: e-pill 8 Alarm HAGER Vibrating Alarm Watch Silver / Black ('square look', sold 2010-2014) Operating Instructions. Manual: e-pill 8 Alarm HAGER Vibrating Alarm Watch Silver and Black with Red Buttons (sold 2013 - 2016) Operating Instructions.